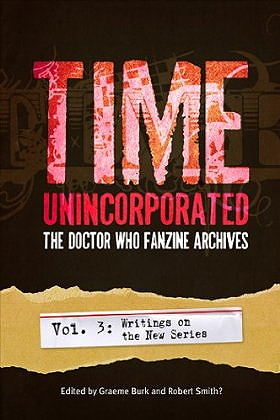 In Time, Unincorporated, the best essays and commentary from a range of Doctor Who fanzines are collected and made available to a wider audience. In spirit, this series picks up the torch from Virgin's License Denied collection (1997), concentrating some of the most delightful, insightful and strange writings on Who into a single source.The third and final volume of this series contains nearly 65 essays that examine the new Doctor Who up to and including the 2010 series starring Matt Smith. The essays stem from a wide array of fanzines such as Enlightenment, Tides of Time, Shockeye's Kitchen, Movement and more.As a bonus, nearly 20 of the essays were written exclusively for this volume by the likes of Doctor Who script editor Andrew Cartmel; novelists Jonathan Blum, Kate Orman, Lloyd Rose and Steve Lyons; Tammy Garrison (Torchwood Babiez); and Lynne M. Thomas (Chicks Dig Time Lords). With a foreword by new-series writer Robert Shearman (Running Through Corridors).